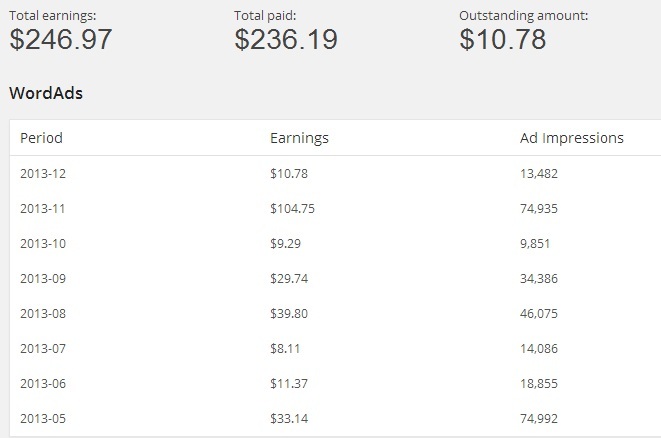 This entry was posted on Sunday, January 19th, 2014 at 9:28 pm	and tagged with WordAds, WordAds earnings, wordads pay rate, wordads payment, wordads payout, wordads review, WordAds vs AdSense, wordads wordpress and posted in commentary, hodgepodge, personal matters. You can follow any responses to this entry through the RSS 2.0 feed. To bigger and better things this 2014, Mark! Seems that I’m finding a number of people I know aiming to sail beyond the harbor. Best! Kuya Anjo, long time no hear! How are you? Hi Mark, doing well. Taking a break after the Yolanda coverage. But I’ve yet to find time to think hard about my goals for the year. Yep, long time nga! Good to know you’re faring well too. So what are your plans now? I think it’s better kung umalis ka na sa WordPress and buy a hosting plan from Hostgator. By doing that, you’ll be in more control. Then, you can monetize your blog through Google Adsense initially. Sayang yung traffic mo eh. If you need help, please don’t hesitate to contact me. Heck, I can even help you promote your blog through my website:) Good luck! Thanks for the offer of assistance! I really appreciate it. I’m very grateful to my buddies in FBW and APB. Ang dami kong valuable insights na nakuha. Right now, I’m leaning on getting a hosting plan either sa HostGator or sa BlueHost. Nagbabasa pa ako. How to register adsword for my blogspot site? You can register at WordAds.com.